I hope you find great value in these Quotes about Wealth from my large collection of inspirational quotes and motivational sayings. much more important than wealth and privilege. and the fit inheritance of generations and nations. it does away with the brother of talk after dinner. Hazard not your wealth on a poor man's advice. stock certificates, bank notes, and coins. in industry from spoiling the situation for everybody. mind has prevailed over wealth and brute force. will get hold of global wealth. create something that they can leave for their children. nearly or remotely have been the fertile source of their possessions. and started the inventory of our acquired wealth. of power that undermines democracy. not silk and cotton and gold. in the excess of his wealth, has kicked the great altar of Justice out of sight. but as a path for realisation and salvation. To get rich never risk your health. For it is the truth that health is the wealth of wealth. 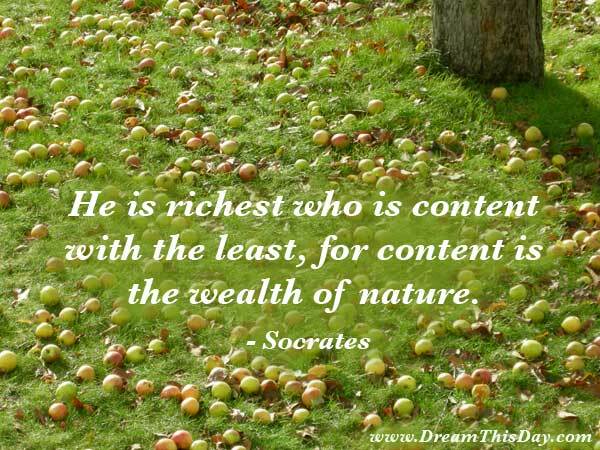 Thank you for visiting: Wealth Quotes.